Earlier in the year I wrote a blog about the scaly crickets at Branscombe and how they had survived the storms earlier in the year. In October I received an email from Peter Sutton the national recorder for grasshoppers and crickets who told me that he had been looking for the crickets at Branscombe and had failed to find any – he was fearing the worse but then he received an email from Karim Vahed which detailed how he had found 47 crickets (10 males and 37 females) in just 9 pitfall traps! The secret perhaps was that he baited them with sausage and sea bream! I had only found 7 females but then again I only used a pasty as bait (albeit a Waitrose pasty) – I will know better next time! 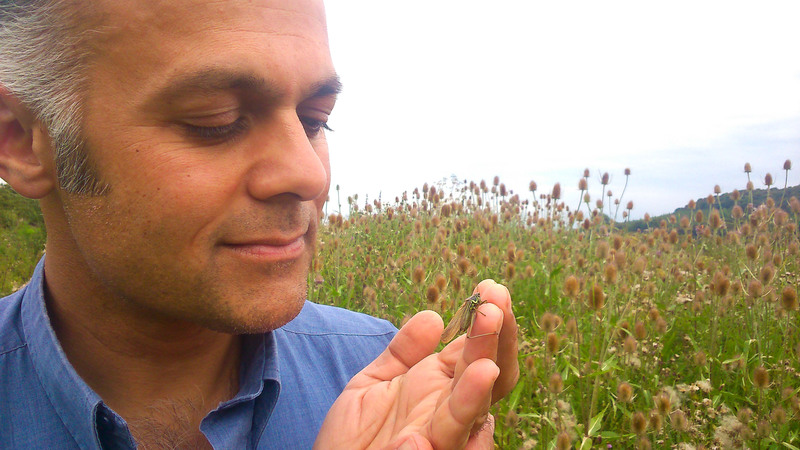 Karim is the Professor of Entomology at Derby University and has been studying scaly crickets, their genetics and distribution for a number of years. 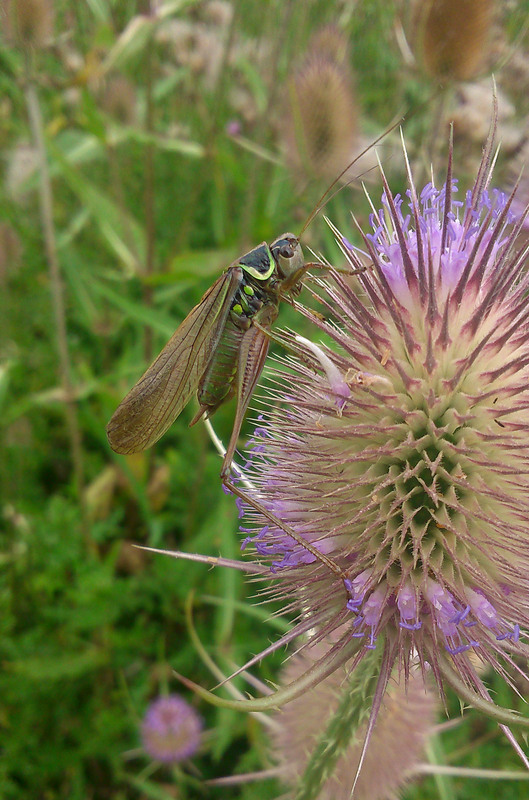 We have now exchanged a few emails on orthoptera and hopefully we will meet up some time. Interestingly Karim also found another species when he was down in Devon – he found a Roesel’s bush-cricket near Rewe – a new record for the county! This species has been spreading northwards over the last 10-15 years probably as a result of climate change. It however hadn’t spread west so had not reached Devon – well now it has. Karim kindly supplied me with some photos of the species – all the pictures were taken by K. Bellis. Beautiful markings – note the long wings – usually Roesel’s bush-crickets have short wings – it is thought that this long winged form occurs when individuals become ‘crowded’ in a local population – the long wings enables the animal to fly and therefore occupy and colonise new territory. The long winged individuals are knows as macropterous. I once found a macropterous individuals when I was a Wicken Fen – they are quite unusual. 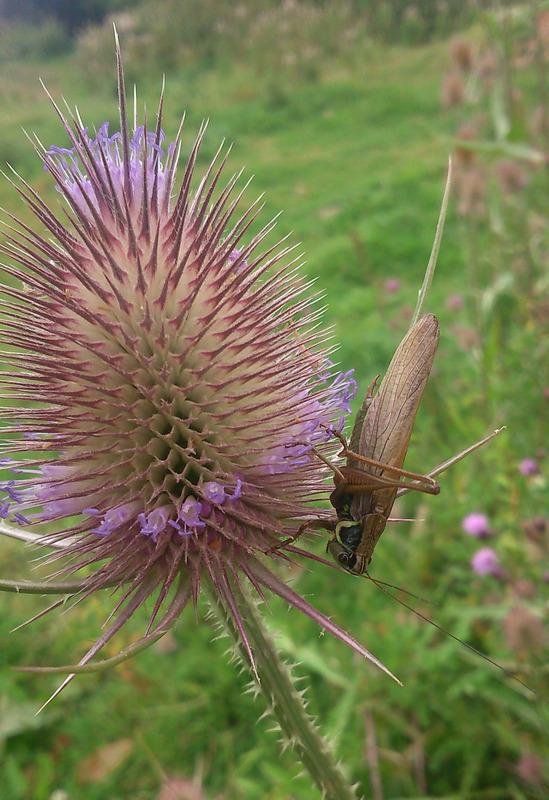 Many thanks to Karim for all the information on scaly crickets and the record and photos of the Roesel’s bush cricket. Thank you to K Bellis for allowing me to use the photos.